This commemorative envelope, distributed by the Land of Lincoln Barbed Wire Collectors Association, celebrates Jacob Haish's barb wire creation. 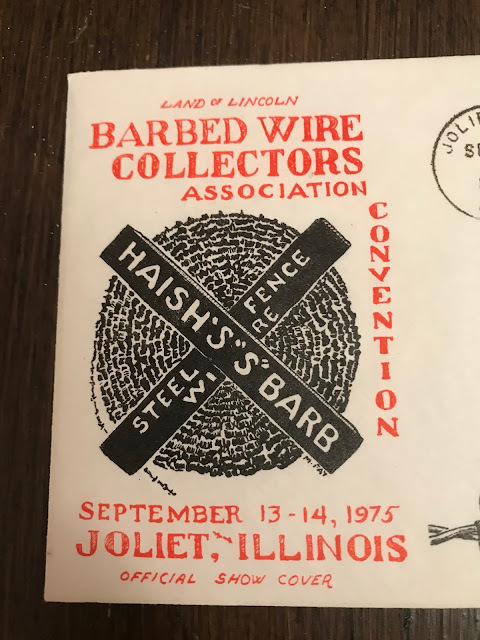 The front of the envelope illustrates a spool and a single piece of Haish's "thick set 'S' barb." 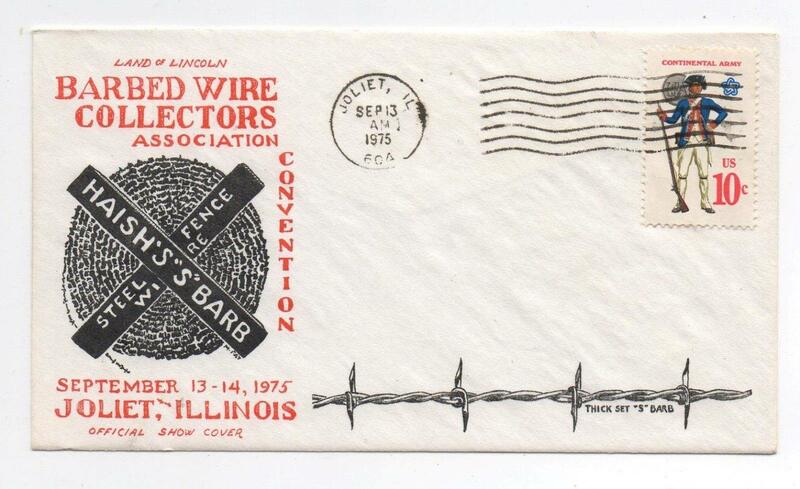 The envelope is postmarked 1975 and details the Land of Lincoln Barbed Wire Collectors Association Convention in September of that year. 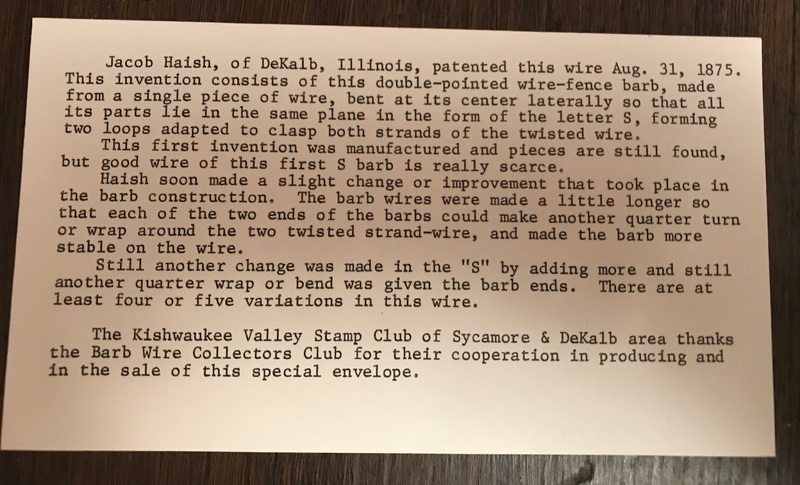 "Jacob Haish, of DeKalb, Illinois, patented this wire Aug. 31, 1875. This invention consists of this double-pointed wire-fence barb, made from a single piece of wire, bent at its center laterally so that all its parts lie in the same plane in the form of the letter S, forming two loops adapted to clasp both strands of the twisted wire. This first invention was manufactured and pieces are still found, but good wire of this first S barb is really scarce. Haish soon made a slight change or improvement that took place in the barb construction. The barb wires were made a little longer so that each of the two ends of the barbs could make another quarter turn or wrap around the two twisted strand-wire, and made the barb more stable on the wire. Still another change was made in the "S" by adding more and still another quarter wrap or bend was given the barb ends. There are at least four or five variations in this wire. 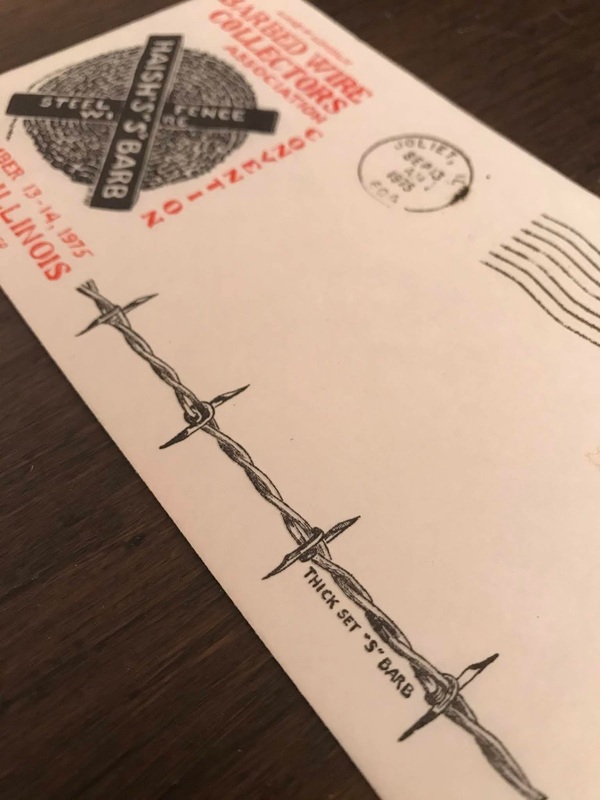 The Kishwaukee Valley Stamp Club of Sycamore & DeKalb area thanks the Barb Wire Collectors Club for their cooperation in producing and in the sale of this special envelope." Thanks to Danny Wright (editor of The Devil's Rope Museum's newsletter) for sharing this with me. The card provided inside the envelope.